Combining the rugged durability of an all leather boot with the lower weight and easy-wear nature of a textile boot Yucatan is a deservedly popular choice for light hiking and backpacking. Yucatan has received a series of significant upgrades which guarantee even better comfort and reliability. WEIGHT: 1325 grs. pair size 7,5 U.K. The upper is primarily constructed from premium quality split leather with carefully placed synthetic textile panels for extra suppleness and a rubber toe-cap for protection. The result is a great balance of easy to wear comfort, low weight, durability and good looks. As a significant upgrade for 2017 Yucatan now comes fitted with our top spec Dry-Line™ waterproof lining for unrivalled waterproof breathable performance and reliability in all weathers. Unlike lesser walking boots Yucatan is built on a board-lasted platform with a full length midsole for superior underfoot support and protection on rough terrain. The Vibram™ Due Rocce offers excellent grip on a wide variety of surfaces with well-spaced tread blocks that avoid clogging in muddy conditions and features a special TPU piece under the heel for added torsion control. Yucatan is ideally suited to 2-3 season hiking and backpacking below the snow line. 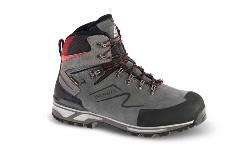 Mazama is a lightweight and comfortable boot with a softer flex designed for general trekking and hill walking. This new second generation model features many significant upgrades to guarantee Mazama delivers more comfort and reliability than ever before. A no-compromise mid-height shoe built for the mountain. Drom packs all the performance features you need and will take you where you want to go. Perfectly at home walking to your local crag or high in the mountains, Drom is like a 4x4 for your feet.